Madrid. Círculo de Tiza. 2018. 459 pages. 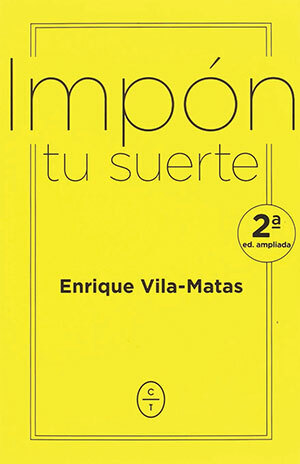 Impón tu suerte, expanded, corrected, and now painstakingly amended by Aznar Pérez within months of the first edition, is a defining aesthetic statement by Enrique Vila-Matas, one of a handful of Spanish authors with verifiable international recognition (his work is translated into thirty-six languages and merited numerous international prizes) and influence. 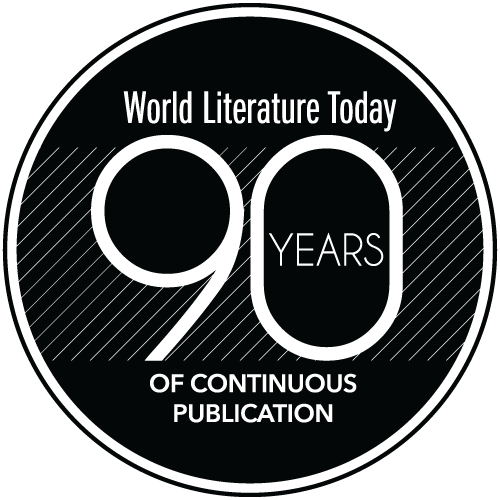 This, his fifteenth collection of literary nonfiction culled from general culture magazines, newspaper columns, conferences, and a few academic venues, adds to his ongoing revamping of conventions and traditions. Adept at the multiplicity of forms and nuances attendant to worldly “autobiografiction,” the author has penned more than twenty novels—notably 1985’s A Brief History of Portable Literature (2015) and 2000’s Bartleby & Co. (2004)—that enhance the allusive pieces included in Impón tu suerte. An incisive and indefatigable reader of world literature, Vila-Matas is a paradoxically popular cult writer, particularly cherished by younger Latin American authors, in some of whose novels he is a main character. Recently, he is refashioning his fascination with the new avant-garde and the self-begotten fiction he masters, being equally concerned with interactive art: between January and April 2018 he curated “Cabinet d’amateur, una novela oblicua,” based on the relation between his work and art installations for London’s Whitechapel Gallery. Impón tu suerte’s four parts are respectively devoted to Writing, Reading (the most extensive), the Gaze (devoted to art), and the Idea, with a lucid prologue by Pérez and an explanatory epilogue by Vila-Matas as bookends. Beginning with “El futuro,” his acceptance speech upon receiving the 2015 Guadalajara International Book Fair prize in Romance languages, there are 140 pieces from 2000 to 2017, some from his column “Café Perec,” in which he published over two hundred notes between February 2010 and December 2018. In terms of that prolificacy, Impón tu suerte is more a statement than an anthology (a few texts are part of other collections or of what he calls “voluble ledgers”), and a running thread is the coolness, amiability, and matter-of-factness with which he starts every piece. What kind of reader is he? Judging by Impón tu suerte (from René Char’s impose ta chance, roughly, “trust firmly in your luck”), he absorbs twentieth-century world literature and suffers national identity politics lightly, carefully meting out credit where credit is due, as in the pieces about his compatriot Juan Marsé. The theoretical but direct scaffolding for comprehending his meticulousness at contextualizing literary developments occupies part 4, “The Idea.” Conceptually, he is drawn to Duchamp, Gracq, Dalí, and Blanchot, with some nods to Barthes and David Markson. But, even with them, he exhibits the coolness of an intellectual who “when in doubt, play[s] insane,” an attitude also useful when he devotes attention to writers who have lapsed into literary obscurity, entangling their texts to show that there is no anarchy in refuting traditions and their politics. A necessary corrective to reigning aesthetic conceits, Vila-Matas’s writing has a perfect sense of conceptual timing that avoids throwaway lines, perfectly comprehensible when considering how extensively he reads. Because his boundless tool is the dynamism of language, his narrative and nonfiction strike universal chords when he writes about the poetics of failure, authenticity, minimalist essayists, the metaliterary, Tarantino, hipsters, Facebook, and the like. Ultimately, Impón tu suerte asks readers to go with their instincts, and Vila-Matas’s cerebral coolness when facing high- cultural stakes ensures that his arguments are companionable.